Think, timelessness and high-quality craftsmanship sharing a space with modern art, interesting textures, and collected treasures. Think, no rules. Mix your metals, paint your heirloom sideboard and illuminate your antique oil painting with sleek, modern lighting. 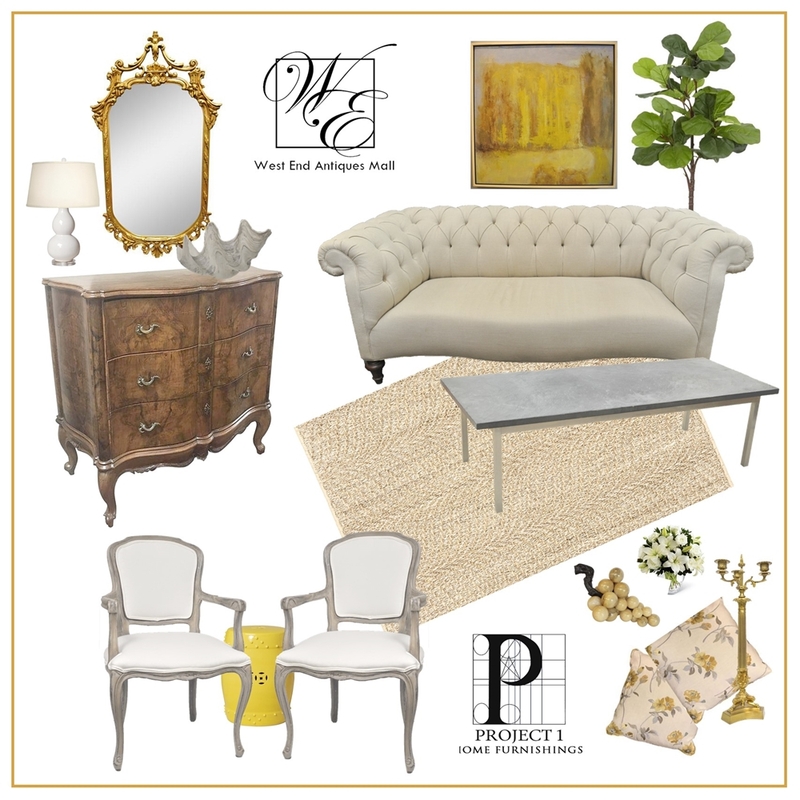 We recently did just that with this room setting using pieces available at West End Antiques Mall and Project1 Home. We think it ticks all the boxes for a fresh New Traditional look. Traditional Home Magazine’s – Annual Rising Stars of Design Awards spotlights“ New Traditional” designers . One of of the designers recently featured is Lauren Liesse, she shared her thoughts on the style with Traditional Home . When asked, how would you define today’s “new traditional” design? 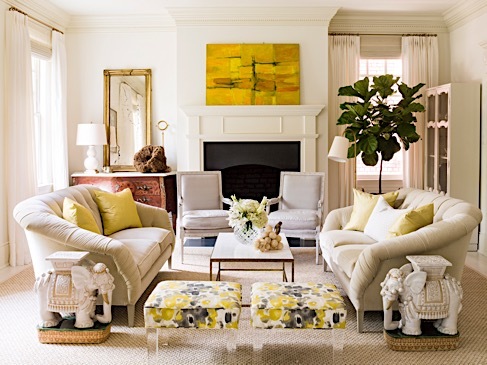 Washington DC area designer Lauren Liesse responded, ‘To me, today’s “new traditional” design juxtaposes traditional elements with modern ones. Each element is set apart and made more interesting because of the contrast’. Give us a couple of examples of modern and traditional design elements that work well together. ‘Sleek concrete or raw wood pieces mixed with gilded antiques. Aged leathers and Lucite’. Lauren’s New Traditional design for a former consulate in Washington inspired us to recreate the look below with furnishings and accessories available at West End and Project1. Art – “Hedgerow” oil on canvas (below), by Dallas Mosman available through Crossroads Art Center. What is a classic color combination that still feels fresh? ‘Blue and white’. This blue and white setting at Project1 featured updated traditional sofas, a mix of modern and vintage lighting and modern art, along with Lauren’s suggested touches of gilded antiques (mirror) and stripped wood (mantelpiece). Do you have a favorite go-to palette at the moment? ‘I always love black and white paired with warm browns and a touch of green from plants’. We channeled Lauren’s go-to palette with a vintage server and octagonal dining table, again re-imagined with Fine Paints of Europe. Newer faux bamboo arm chairs by Jonathan Adler, a mid-century Astrolite lucite bowl by Ritts of Los Angeles, and antique etchings complete the new traditional look. A contrasting mix of modern and classic accents atop an antique court cupboard anchors this space. Updated damask and complimentary patterned upholstery on the Chippendale sofa and mid-century modern chrome chairs provide a calm, neutral palette. Chairs and photography available at Project1. If the thought of mixing styles from different eras takes you a bit out of your decorating comfort zone, don’t worry. Richmond designer Geraldine Duskin offers this advice, ‘Have confidence in your individual taste and don’t be timid or too trendy. The world of design is at your fingertips online, so take advantage of it. Engaging a decorator can help you organize and refine your choices’. The neutral colored walls and lighter stained floors provide a clean modern canvas in this room by Geraldine Duskin Design. 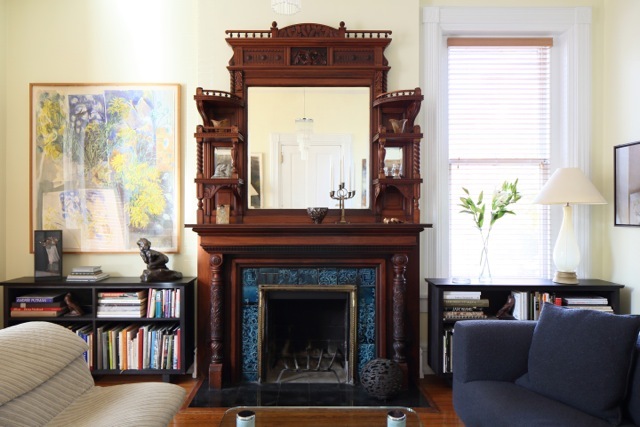 The low modern bookcases flanking the Victorian era mantelpiece lend balance and symmetry.